It wasn’t just Pakistan. The weird, vaguely avian drone of unknown origin that curiously showed up in Pakistan last year apparently made a different flight — to Iraq. It may have even migrated to Pakistan from Basra. In August 2011, Pakistani forces recovered a small, silver, unarmed aircraft that had crashed in Balochistan province. With silver wings and a span about the size of a grown man’s outstretched arms, the drone was clearly more than a hobbyist’s toy: the remains of a camera were near the crash site, a camera that fit into the robotic bird’s belly, ostensibly for spying on insurgents. No one claimed responsibility for the drone, but when Danger Room checked into it, we found it suspiciously reminiscent of Festo’s SmartBird, a drone that used the herring gull to inspire its design, although there were enough differences in the wings, tail and fuselage to render it distinct. The mystery continues. A reader of David Cenciotti’s Aviationist blog found new imagery of the unknown bird, from at least two years before its Pakistani excursion. And apparently, its earlier spotters were Iraqi insurgents. The image above, along with a few others on The Aviationist, come from Iraqi Hezbollah, a Shia insurgent group that despite its name isn’t an adjunct of Iran’s Lebanese proxies. 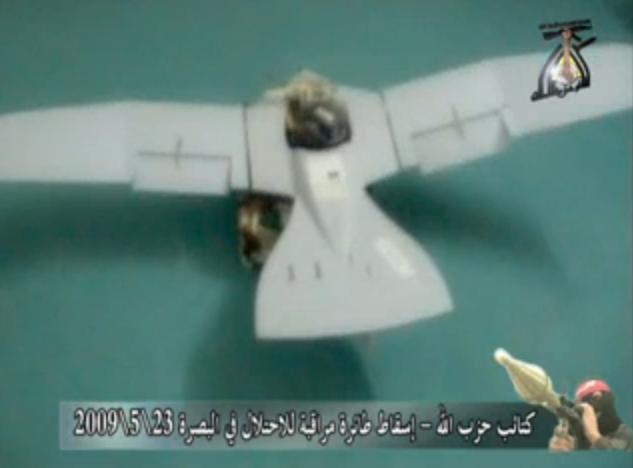 Iraqi Hezbollah date its photos of the mystery drone to May 2009 in Basra, a major city in southern Iraq. Back then, U.S. troops were training their Iraqi counterparts on new-line intelligence, surveillance and reconnaissance systems. Hmm. If the mystery drone was in use in Iraq, or anywhere else, earlier than 2009, we’re unaware of it. It’s worth noting that the Air Force is experimenting with small drones modeled after birds, the better to conceal from watchful insurgent eyes. And it’s of course suspicious that the drone has appeared in two of the places that the U.S. military is most interested in, at the times when the military was most interested in them. But the military hasn’t acknowledged keeping any drone like this in its robotic aerie — so now we’re wondering where the mystery drone will turn up next.